In spite of community protests over excessive concessions to the developer and the loss of residential spaces, Lincoln Properties' 316-322 Summer St. office project was approved by the BRA board in December. The owner of 355 Congress is now challenging the zoning of the project. Details in the Herald article below. The developer of a controversial $32 million office project on Summer Street in Boston is facing further delays. 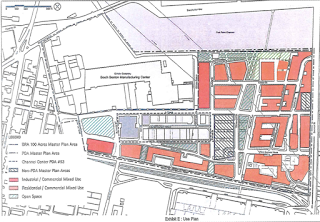 Francis X. Crowley, owner of 355 Congress St., has filed suit in Suffolk Superior Court seeking to overturn the city’s Zoning Board of Appeals decision allowing Lincoln Property Co. to turn two vacant warehouses in Fort Point into a 140,000-square-foot office complex. Following the project’s approval by the Boston Redevelopment Authority in December, the ZBA granted zoning variances allowing Lincoln to exceed the height, setbacks and floor area ratios at 312-324 Summer St. The suit alleges that the ZBA exceeded its authority and that the development will exacerbate traffic problems, contrary to the board finding that the project will not harm the neighborhood. “We are shutting down until the suit is resolved,” said John Cappellano, Lincoln’s senior vice president. Neither Crowley nor his attorney, Patrick Dinardo, returned calls seeking comment. Originally approved in 2006 as a residential development, Lincoln later bought the property and proposed to convert the two abandoned warehouses at 312-320 and 316-324 Summer St. into one office building with 15,500 square feet of ground floor retail. That move generated howls of protest from Fort Point residents. At several packed public hearings last year, neighbors blamed the BRA for abandoning the city’s vision of a Fort Point district that would include a 24-hour, mixed-use neighborhood anchored by 11 acres of open space and 6 million square feet of development, with at least one-third as housing. But city officials said the housing market was stalled and preferred that the building be redeveloped into office space rather than remain vacant. Labels: 316 Summer St., development, Lincoln Properties, Summer St.